MediaFire is one of the most popular cloud storage company has released desktop client software for Windows and Mac users. With this software, you can integrate all of your cloud files and folders with your Windows PC. Now MediaFire provides simple solution to upload and manage files with your PC similar to Google Drive and Dropbox. MediaFire provides free 50 GB online storage for all users and more paid plans also available. The desktop client will automatically sync all of your files and folders across all the devices, so you can access your files from any device like phones,tablets and PC. And you can share your files directly to social media contacts from your desktop PC. Sharing Permissions – You can control the level of access by setting permissions for specific files and folders. 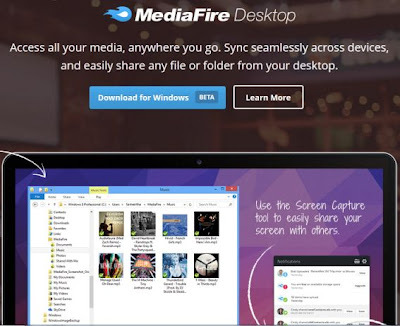 Following Tools – MediaFire allows you to follow shared files from other desktop users and download files easily. You can track downloads of each files and get notifications when your files are modified. Automatic Audio & Video Transcoding - Download audio and video in the perfect optimized format for your device.